Why the wait? Doctors wanted to make sure little Abrahim Hassan reached the 5-month mark to make sure he didn’t have the same condition that killed his siblings. The genes for the disease are housed in the DNA’s mitochondria, which provide energy for the cells and carry 37 genes that are passed down on the mother’s side. The couple sought the help of John Zhang and his team at the New Hope Fertility Center in New York City. Zhang is one of the first engineers of the “3-parent” technique, which can be accomplished a few ways. In the United Kingdom, the procedure is called pronuclear transfer and involves fertilizing both the mother’s egg and a donor egg with the father’s sperm. Each nucleus is removed from the eggs before they can start dividing into early-stage embryos. From there, the nucleus from the donor’s fertilized egg is discarded and replaced by that from the mother’s fertilized egg. However, Shaban and Mahmoud opposed the destruction of 2 embryos due to their Muslim faith. So, Zhang used a procedure called spindle nuclear transfer. He removed the nucleus from one of Shaban’s eggs and inserted it into a donor egg that had its own nucleus removed. 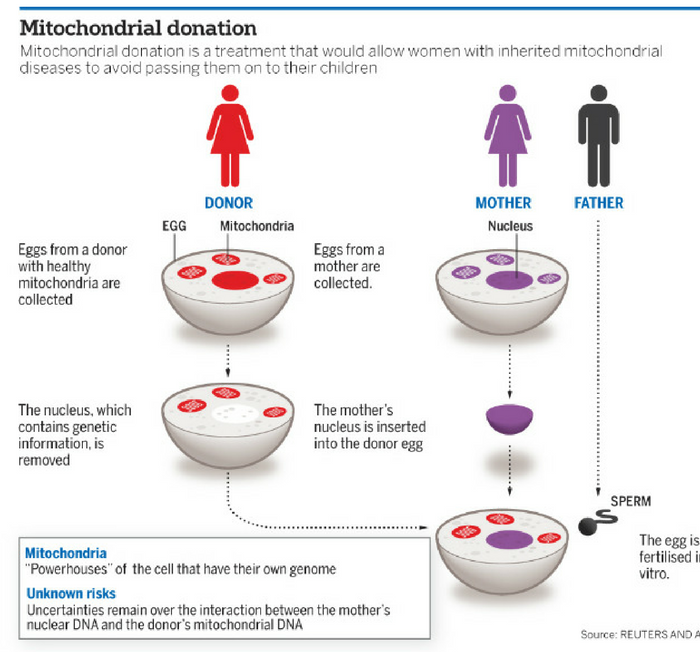 The resulting egg – with nuclear DNA from the mother and mitochondrial DNA from a donor – was then fertilized with the father’s sperm. In total, 5 embryos were created from the procedure, but only 1 developed normally. The surviving embryo was implanted in Shaban and the child was born 9 months later. Zhang had to perform the procedure in Mexico, because spindle nuclear transfer is not approved in the United States; however, pronuclear transfer is. The 3-parent technique was first attempted in the 1990’s. The last time embryologists tried to create a baby from 3 parents’ DNA, the injected mitochondrial DNA from a donor was injected into another woman’s egg, along with sperm from her partner. Sadly, some of the babies went on to develop genetic disorders. This resulted in the technique being banned. It’s possible the problem arose from the babies having mitochondria from 2 sources. When Zhang and his team tested Abrahim’s mitochondria, they found that less than 1% carry the mutation. They hope that’s too low to cause any problems. It typically takes about 18% of mitochondria to be affected for genetic disorders to emerge. Bert Smeets at Maastricht University in the Netherlands said the team should monitor the child to make sure that number doesn’t rise. It’s not beyond the realm of possibility that faulty mitochondria could be better at replicating, and gradually increase in number. Read: Biotech is Creating GMO Human Babies: What Could Possibly go Wrong?